To start off Hardware it is necessary to note that the handset fully supports European LTE networks that will include (800 / 850 / 900 / 1800 / 2100 / 2600) on bands 1, 3, 5, 7 and 20. Moving onto HSPA+ connection – Samsung Galaxy Note 3 is capable of running on (850 / 900 / 1900 / 2100). Depending on the Region the device is produced for – there are two variations of the CPU (Qualcomm or Exyons). Nevertheless the model is packed up with quad-core Snapdragon 800 processor that has a clock speed of 2.3 GHz. As for the Random Access Memory it has 3 GB of preinstalled RAM. Device offers 32/64 GB of flash memory and you can add additionally up to 64 GB with memory card. As for the wireless capabilities – the newly released Galaxy Note 3 supports Bluetooth 4.0, Wi-fi networks 802.11a/a/g/b/n as well as the fastest ac module! On top of that you have GPS, DLNA, GLONASS technology as well as NFC chip at your service. 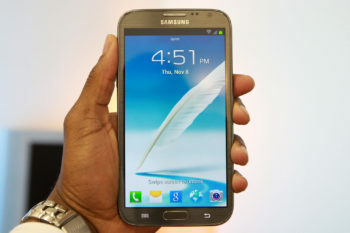 f SG note 2 had only 267 ppi, this adds up to the total price increment of £90 from SGN 2, in case you have not noticed yet. Overall this display is great. Colors are vibrant, vivid, viewing angles are sharp. It might look sometimes as if the picture is too saturated, depends on your preferences, brightness et cetera. What makes Samsung Galaxy Note 3 to stand out is not the software (as some of you might think) but S Pen. It works beautifully with Android 4.3 and Samsung Hub software to provide you with the perfect usability. If you are removing the accessory from the trey – you get a pop-up window on the screen with 5 options: Action Memo, Screen Write, Scrap Booker, S Finder and Pen Window. However you can still get this menu by pressing the s-button on the accessory. Additionally there are extra features that come with S-pen as well: Air View – lets you to preview objects from Gallery. While viewing photos you have the option to get the instant access to cropping/editing the photo by simply clicking on the S-Pen. It’s a good accessory that makes this device outstanding. The device offers 13 megapixel rear camera and 2 megapixel front facing camera. In terms of video shooting – you have the 4K technology packed in this device. Under normal light conditions pictures turn out to be just fine with good color, light depth, details balanced. Finally, after analyzing the device’s specs it is clearly understandable that technology is improving and reinventing itself constantly. This device offers a lot and will most likely find its niche in society. If you are on the market for device that will be easy to spy on and that has superb technical features – this should suite you just fine. TopSpy cell phone spy offers you the intense spying solution, perfect for protecting/monitoring your kids’ activities or your business. Wireless technologies as of New ac wi-fi – will set new records in terms of information processing/transferring to your side. For example – you will get media from device in less than a minute, speaking of regular logs – they will be there in a split second, waiting for you on your Control Panel. On top of that you get GPS, DLNA, GLONASS technologies that will provide a precise Location Tracking conditions to use with the TopSpy cell phone tracker.